— The event is open to all livestock producers and farmers in the county. For more information, call J.D. Sexton, Moffat County extension agent, at 824-9180. Ervin and Arloa Gerber’s yard looked like an oasis. A rock fountain burbled near their front door, and peacocks strutted nearby, flaunting iridescent plumes of sapphire and emerald. If this was all you saw of the Gerbers’ cattle ranch west of Craig, you could believe Mother Nature had been good to them this year. But their well-tended yard belied the wasteland that waited not far from their doorstep. Beyond a line of trees and a barbed wire fence, a barren pasture baked under an unforgiving sun. The grass that usually grows here lay dormant for lack of snow and rain. About the only thing that grows green out here is the weeds, said Arloa, 68. The Gerbers are used to being at the whim of forces beyond their control. It’s part of the lifestyle. This year, though, the elements seem to be especially cruel to the Gerbers along with other ranchers in the region. “(Of) everybody we’ve talked to, nobody has ever seen it get this dry this soon,” Arloa said. Aldis Strautins, service hydrologist for the National Weather Service in Grand Junction, said Craig, Moffat County and much of northwest Colorado is experiencing extreme hydrologic drought conditions. Hydrologic drought pertains to the effect precipitation has on surface and subsurface water supplies. According to a year-to-date report compiled from Jan. 1 through June 28, Craig has received 1.58 inches of precipitation. Normal precipitation through June averages at 7.46 inches. The U.S. Geological Survey recently upped northwest Colorado’s hydrologic drought classification to “extreme,” citing higher than normal temperatures, strong winds and little moisture. According to the agency’s drought monitor classification scheme, extreme hydrologic drought conditions feature the potential for major crop and pasture loss, water shortages or restrictions, and frequent wildland fire activity. Although there is no current data from Craig, Strautins said hydrologic conditions in neighboring Maybell and Steamboat Springs are at 4 percent of normal levels. After a second consecutive La Nina weather pattern this winter, which typically brings higher than normal snowfall, much of the country slipped into a neutral weather pattern at the end of April. Neutral weather patterns are a wildcard, Strautins said, and could result in extreme wet or dry weather. Although there is a potential for the weather to change at any time in a neutral weather pattern, he believes residents in the region should brace for more hot and dry weather as there is little to no moisture in long-term forecasts. Salvation may finally come in the form of a fall shift to an El Nino weather pattern, Strautins said. An El Nino pattern typically means a return to normal or slightly higher than normal precipitation levels during the fall and spring months. Unlike La Nina systems, where precipitation is heaviest during the winter, El Nino winters tend to be dry. But as was the case this past winter, where high rates of snowfall were predicted during the La Nina winter, anything can happen, particularly in northwest Colorado. “I don’t want to get anyone’s hopes up,” Strautins said. “The pattern calls for precipitation to be slightly higher than average or about average, which would certainly be better than what we had last year. The Gerbers felt a pang of concern as they watched a dry winter unfold, but there still was a chance spring rains would come, Arloa said. But the rain didn’t come, and the couple is now facing bleak prospects. They may have enough pasture to last through July, “but I don’t know what we’ll do after that,” she said. They have hay leftover from last year, but they’re reluctant to feed it to their cattle this early in the year for fear they won’t have enough for them next year, Arloa said. Dry conditions scorching their pastures also are beating down on local hay fields, like those of Ramona and Bill Green, who have a family ranch north of Craig. They estimate they will have a 90 percent loss in their hay yield this year, Ramona said. “The hay crops are just nonexistent,” she said. Their grazing lands aren’t faring any better. Between a lack of moisture and cold temperatures this spring, the grass never had a chance, Ramona said. What the Greens are seeing in their own fields mirrors what other ranchers are facing throughout the county. The loss rate on dryland hay pastures—or unirrigated fields that rely solely on natural moisture—is at nearly 100 percent. Although the haying season hasn’t started in earnest, early indicators show that even irrigated fields will yield about half what they would normally produce, said J.D. Sexton, extension agent at the Moffat County Extension Office. “It’s pretty bleak,” he said. As a result, local producers are buying hay from Montana, the Dakotas and across the country. The Greens could only fight against a tight-fisted Mother Nature for so long. “When the grass never came, we decided that we’d better start getting rid of some cows, and hopefully — we’re keeping our fingers crossed — we’ll be able to maintain the rest of the herd,” Ramona said. The Greens got a decent price for what they sold, but they also lost something they can’t replace — the genetic makeup they’ve cultivated over time in their cattle, Ramona said. The Greens are among a number of local ranchers who have had to sell stock because of a lack of water and pasture, Sexton said. He couldn’t estimate how many animals have been sold so far this year because of the drought, but in his view the fact that ranchers are selling at all is a grim harbinger of what could come. “Anytime that we have to sell off livestock because of a drought, it’s significant because it’s something that we are not expecting to happen,” Sexton said. Although selling animals yields immediate payout, it could have negative impacts down the road, like a lack of income-generating livestock the following year, he said. But the loss ranchers could face if the drought persists goes deeper than numbers on a balance sheet. The Gerbers aren’t keen on prognosticating what nature, a fickle provider, will give them in the months and years to come. And as bleak as their situation may seem, she’s confident the industry — and, perhaps more importantly, the ranching lifestyle — won’t disappear, even when if rains still don’t come and the sun continues to beat down on their dry fields. “I don’t see how it could ever disappear because where would everyone get their McDonald’s hamburgers?” she said, laughing. 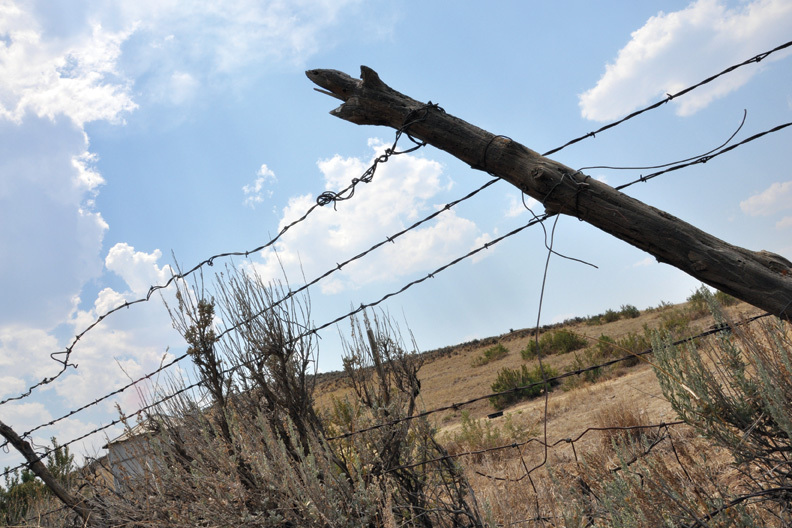 Sexton is planning a drought management workshop for 7 p.m. July 12 at the Moffat County Fairgrounds Pavilion for local livestock producers, “just because we’ve got a lot of folks that are in a lot of trouble because we are so dry (and) so limited on feed and water,” he said. For more information call him at 824-9180.